Healthcare leaders have been hearing a lot about the Malcolm Baldrige National Quality Award over the last fifteen years, and for good reason. Baldrige has become an increasingly common framework used by top performing hospitals, and has become one of the dominant industries represented in the national annual quality award competition administered by the U.S. Department of Commerce’s National Institute of Standards and Technology (NIST). On May 16, NIST announced that 34 businesses across 5 business sectors are vying for the prestigious award in 2016. Of those, a whopping 62% (21 of the 34) were healthcare organizations (16 of 26 applicants were in healthcare in 2015, also 62%). Every year since 2002, there have been at least 10 healthcare applicants and at least one healthcare Baldrige Award winner. For healthcare leaders, the first thing to notice about the structure is its focus primarily on results and secondarily on leadership. Today’s leaders know that in this fast-paced and ever-changing healthcare landscape, nothing is more important than achieving results. Our communities and our stakeholders demand and deserve great healthcare outcomes. Baldrige places nearly half of the framework’s focus on achieving and maintaining superior results. And, of the six remaining framework areas, notice what plays the biggest role in achieving results: leadership. Baldrige focuses on important leadership factors like vision, values, and mission; communication and organizational performance; governance; and legal and ethical behavior. Baldrige award recipients are significantly more likely to win a 100 Top Hospitals national award. Baldrige hospitals were significantly more likely to display a faster pace of performance improvement over a five-year period. Baldrige hospitals were 83% more likely to win a 100 Top Hospitals national award for excellence in balanced organization-wide performance. Baldrige hospitals outperformed non-Baldrige hospitals in practically all individual performance measures used in the 100 Top Hospitals composite score. Finally, healthcare leaders are often concerned that Baldrige won’t fit with other performance improvement initiatives like achieving Magnet status, maintaining accreditation with The Joint Commission, or participating in Institute for Healthcare Improvement (IHI) initiatives. The good news is that Baldrige’s non-prescriptive approach is 100% compatible and congruent with these approaches. The Baldrige framework allows leaders to organize and integrate multiple approaches to improve patient outcomes and achieve and sustain performance excellence. If you need a little help starting your Baldrige journey, try beginning with some of the great (and free) resources offered by NIST at www.nist.gov/baldrige. 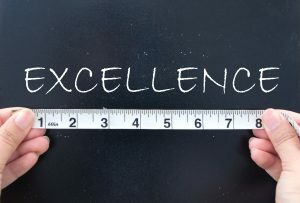 In particular, if you’d like to learn more about the criteria and how it improves organizational performance, a great place to start is Baldrige 20/20: An Executive’s Guide to the Criteria for Performance Excellence (available for free download at http://www.nist.gov/baldrige/publications/baldrige_20_20.cfm). If you think you’re ready to take a crack at assessing where your organization stands today using a simplified version of the Baldrige framework, try the quick and easy Are We Making Progress? tool (available for free download at http://www.nist.gov/baldrige/publications/progress.cfm). And, when you’re ready to progress in your performance excellence journey and don’t want to go it alone, contact Hawkeye Business Solutions at 540.232.9920 or info@hawkeyebusinesssolutions.com and we’ll help you jump-start your efforts.